When is a Mormon prophet speaking as a prophet? Nobody knows for sure. Dr. Riess seems to be suggesting that Mormon prophets and apostles can be wrong about what they think the Holy Ghost is telling them (and is directing them to pass on to the members of the Church via their Church callings), while individual members don’t experience such ambiguity and will correctly understand what the Holy Ghost is telling them via personal testimony. Think about this for a minute. If this is true, what is the reason for latter-day prophets and apostles? If a Mormon’s personal testimony is more trustworthy than the pronouncements of Mormon prophets and apostles, wouldn’t it be best to cut out the unstable middle-men and stick with one’s own personal revelation? Dr. Riess’ idea is a highly tenuous one. She gives LDS prophets and apostles a pass because they are culturally conditioned human beings who are influenced by their time and place in history; thus, they are subject to mistaking their cultural views for divine inspiration. Yet, as she has pointed out, so is she. How can she be sure that her personal testimony is not the natural outcome of her own conditioning that she unfortunately mistakes for divine inspiration? This begs the question. On what basis does Dr. Riess accept Mr. Christofferson’s counsel as true? He is “a culturally conditioned human being.” He is “not infallible.” He could be wrong. And so could “the body of the [Church] members,” as has been demonstrated all throughout the Mormon Church’s history. Consider Joseph Smith’s failed Kirtland Bank revelation, Brigham Young’s Adam-God doctrine, John Taylor’s declarations about the never-ending doctrine of plural marriage, and the not-so-long-ago-abandoned racial discrimination that permeated the teachings of multiple Mormon prophets and apostles. The testimony of “the body of the members” in each of these cases (and others) was that these teachings were inspired by God — that the prophets and apostles were, in fact, “moved upon by the Holy Ghost” to say these things. At least, this is what Church members believed for a long time. And in the case of the Mormon teachings on the inferiority of the black race, Church members believed it (and acted on it) for more than a century! Yet “in due time” it was determined that many Church leaders had been merely “voicing their [personal] views” while mistaking them for divine counsel; so the Mormon Church changed course. Now Mormons cross their fingers and hope that the leaders who jettisoned previously affirmed (official) LDS doctrines did so as moved upon by the Holy Ghost. But if not, in due time that knowledge will be made manifest. Think about this for a minute. If Dr. Riess is correct, this whole premise taught by Apostle Christofferson, instead of being great, inspired counsel, may be just the product of a fallible man mistaking his culturally-driven views for the voice of God. If even Mormon prophets and apostles can’t tell whether they are being moved upon by the Holy Ghost, what hope is there that a rank-and-file Mormon will be able to discern the real source of his or her own “testimony”? The biblical view of a true prophet of God is one that does not allow for these kinds of mistakes. A true prophet of God will not give his own views or popular opinion in place of God’s words (Deuteronomy 18:15-22). That, according to God, is reserved for false prophets (Jeremiah 23:25-32). I encourage you, friends, to think about this for a minute. This entry was posted in Authority and Doctrine, LDS Church, Mormon Leaders, Prophets and tagged Adam-God, Church of Jesus Christ of Latter-day Saints, Continuing revelation, False Prophets, Jana Riess, LDS Church, Mormon Church, Moron Prophet, Polygamy, Priesthood ban, Prophets, Revelation 22:18, Todd Christofferson. Bookmark the permalink. 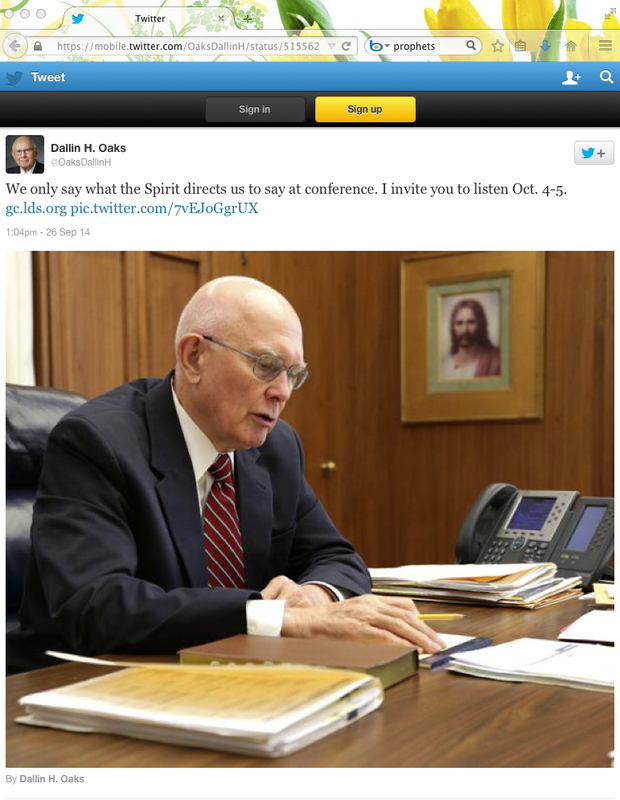 27 Responses to When is a Mormon prophet speaking as a prophet? Nobody knows for sure. How do you know when and LDS Prophet is lying? His lips are moving. I heard this joke in reference to another denomination but it works for LDS as well. Most of what these prophets, apostles and other LDS leaders speak forth today is a lot of rah rah rah go-team-go sort of pronouncements. It isn’t anything different from what any secular motivational speaker would say. So the revelation isn’t much more than some form of exhortation. Didn’t we just have a thread that talked about LDS members “voting” in GC about church doctrinal matters? In-other-words the members “sustain” the prophet’s utterances. So actually in the realm of LDS “counts-doesn’t-count” scenario, what the prophet is saying is merely his opinion and can be kept or tossed-out by individual members, right? Wrong! The faithful LDS member grasps on to every word that the prophet says and treats it like the oracle of the Mormon god. When Smith first created his religion, one of the attractive features to those who followed him, was that they could get revelation also. That’s a powerful concept for rank-and-file folks. Well Smith soon had to dump that idea because if the individual members could receive this type of revelation, Smith’s own position and power would be effected negatively. The other feature of Mormonism that goes with revelation is confirming truth through emotion. So if the LDS person gets a positive emotion then what is being considered is true. So it’s “feel good=true; feel bad=false”. So if someone gets a feeling that is bad about what the prophet says and makes the prophet feel good, then it must be Satan tempting the rank-and-file member, right? Bottom line is that these LDS folks hang-on everything said by the leadership of the LDS church. It’s part of the culture and part of the fun of being a part of the “one true church” with a leader that hears directly from the Mormon god. The crazy this church has become is mind blowing. Gone are the days of “Follow the prophet, he knows the way!” This church has become something I don’t even recognize. What has happened to ” When the prophet speaks. The thinking has been done.” What has happened to the revelations that are given twice a year at General Conference? General Conference has become nothing but inspirational talks that anyone can listen to on any given Sunday in any given LDS ward by any given church member. LDS leaders have become so afraid of their words being broadcasted across the Internet that they’ve stopped being leaders. What revelations have Thomas Monson ever given? None. Just uplifting stories and faith promoting words twice a year. The LDS God has been silent for years. Here’s another place that the faithful LDS member needs to open the Bible and see what a prophet and prophesy is as defined specifically in the NT. The “perfect” to them is the Bible. The “perfect” to those of us who are, for lack of a better term full gospel in our orientation, is Jesus. Jesus is the “perfect” and He will return to establish His Kingdom. Until His return we depend on the Holy Spirit, who is God’s Gift to the Church, and the manifestation of the Spirit, via the Gifts outlined in First Corinthians chapters 12-14. It should also be remembered that women fulfilled the role of prophetess in the Church (see Acts 21:9) something women don’t do in the LDS church. I think it’s always a good idea to consult Scripture in order to establish how God intends His Church to function. By “Church” I mean the Mystical Body of Christ made up of all believers in the Lord Jesus Christ. When I say “believe” I mean “trusting in Christ completely for our salvation a part from any works we might do to qualify for eternal life”. When I say “Jesus” I am not referring to a created Being but to the Second Person of the trinity who is eternal. Sorry for getting nit picky but I’ve learned when dealing with cults or aberrant religious sects it’s important to define terms. So any way you look at it, “the church” is to test a prophet to see if his prophesy lines up with the Word of God. The other thing, when a prophet foretells some future event, did it come to pass? This is nothing like baseball whereby if a hitter has a batting average of .300 it’s considered acceptable. The batting average for a prophet foretelling the future has to be perfect. No excuses! There is the case where a prophet will bring forth a message to encourage the church. This is more global in nature and while subject to test, doesn’t affect doctrine or predict a future event. The Mormon prophets have proven time and again, over the years, that they are simply prophesying out of their own imaginations. There is no consistency and certainly no agreement with the Word of God. The Mormon prophets have been religious free agents pulling ideas out of their hat and foisting them on a people who are willing to receive them. In this, the people bear some responsibility. I honestly dont understand how lds TAke their beliefe seriously anymore with all the former statmenets that contrdict what former prophets have said and taught. I will post a few of the 14 fundamentals in following the prophet. Now before someone comes along and complains that these were written by a “Non-Prophet” So that means we can discard them, I want to remind people of a few facts. 1. When Elder Benson wrote these things, while he was not at the time a LDS (False) Prophet. The Church did not deny any of these things, in fact they believed them. 2. Elder Benson went on to become a LDS (False) Prophet and He never retracted these 14 fundamentals in following the prophet. 3. These are all backed up with LDS scripture to help support and claim they are true, at least according to LDS. So the first one says. For his word ye shall receive, as if from mine own mouth, in all patience and faith. For by doing these things the gates of hell shall not prevail against you. The first on should settle everything, only the Prophet can speak for God, all these debates among LDS should simply end right here with this. Now if this one is True, Lets throw out the 4 standard works. Now this is a good one for LDS, becasue they can use this to toss out all the crazy teachings from the past, Like Adam God, Blood atonment, Etc. Got to the the tricks of the enemy to fool people. The living prophet has the power of TNT. By that I mean “Todays News Today.” God’s revelations to Adam did not instruct Noah how to build the ark. Noah needed his own revelation. Therefore, the most important prophet, so far as you and I are concerned, is the one living in our day and age to whom the Lord is currently revealing His will for us. Therefore, the most important reading we can do is any of the words of the prophet contained each week in the Church Section of the Deseret News, and any words of the prophet contained each month in our Church magazines. Our marching orders for each six months are found in the general conference addresses, which are printed in the Ensign magazine. Beware of those who would pit the dead prophets against the living prophets, for the living prophets always take precedence. This one is great, because it contrdicts so many others. Like the one above I just posted. LDS can claim Adam God and other goofy teachings as truth because the prophet wont lead anyone astray, but on the other hand, for those who dont agree with those teachings, they can claim a living prophet is better than a dead prophet. Simply Genius. We can have are cake and eat it to. This also is great, The prophet can now claim anything he wants and call it scripture since he does not need to say it is of God. Sixth: The prophet does not have to say “Thus saith the Lord” to give us scripture. Sometimes there are those who haggle over words. They might say the prophet gave us counsel, but that we are not obligated to follow it unless he says it is a commandment. But the Lord says of the Prophet Joseph, “Thou shalt give heed unto all his words and commandments which he shall give unto you” (D&C 21:4). And speaking of taking counsel from the prophet, in D&C 108:1, the Lord states: “Verily thus saith the Lord unto you, my servant Lyman: Your sins are forgiven you, because you have obeyed my voice in coming up hither this morning to receive counsel of him whom I have appointed”. Said Brigham Young, “I have never yet preached a sermon and sent it out to the children of men, that they may not call scripture” (Journal of Discourses, 26 vols. [London: Latter-day Saints’ Book Depot], 13:95). There’s not a lot of deep thinking that goes on in these types of religious groups. They just hum along, doing what is expected and not rocking the boat. To question, BTW, is the equivalent of having doubts. So if a faithful LDS member should stumble across this blog, read the article and then the comments it would take a whole lot of thinking on their part to consider the subject matter. Doing a whole lot of thinking is the opposite of accepting what is told by the leadership. The leadership is not to be questioned. Just think what would happen to the level of commitment of an LDS member who didn’t see the “prophet” in the light of what has been taught. If he isn’t really the Grand Poh Bah of enchantment and enlightenment, then he’s not all that special. He’s just another man who worked his way up through the LDS machine. Let’s face it, who would jump through all of the LDS hoops if the “prophet” really wasn’t all that hot? I think if LDS folks could get passed the “emotions as a reflection of personal revelation” they would do themselves a big favor. I’ll add into the mix the “emotions mean confirmation” and “emotions reflect truth” scenario promoted in Mormonism. Can you imagine the number of Mormons who had sustaining feelings about things that are now said to be wrong? Check out the history of the Mormon church and it’s a story of zigzagging here there and every where and nobody blows a whistle or throws a flag. They just keep playing the game even though the rules are continually changing. That’s the problem with accepting someone as a prophet who is probably more clueless than those who are following him and hanging on his every word. Thanks for defining terms, and I actually wholeheartedly agree with you. Simply put the role of a prophet in the New Testament has changed (Heb. 1:1, ESV) Whereas scriptural revelation came through the prophets of the Old Testament, in this New covenant, God speaks through His Son. Therefore, no longer can prophets determine scripture as primary revelators (Eph. 3:5, ESV), and the canon in terms of revelation, inspiration, authorship and usage (as determined by the early church) has been completed. However, that doesn’t mean that God doesn’t have prophets today. Their role is entirely subsequent to apostles etc (1 Cor 12:25,28; Eph. 4:11-12) and reveals the truth of God and the hearts of humans (1 Cor. 14:24-25). I’ve personally met many a false prophet who prophesied or revelations about my life that were completely bogus. On the other hand, I’ve also met many a true prophet who has revealed the secrets of my thoughts (not my observable actions) but my private prayers (in specific detail-no one has heard my prayers that I pray in my mind), and predicted the future correctly. Here Jesus is, haven risen from the dead, which should be enough evidence for anybody, and He points His disciples to the Scriptures for verification. He also provided the means by which they would understand. Notice no burning in the bosom type of emotional experience. It’s a spiritual and cognitive experience. I’m sure they felt something because our emotions are driven by our dominant thoughts, but that wasn’t where Jesus took them for proof of the truth. This is why the Mormon process of prophets, revelation and emotional confirmation is so bogus and dangerous. Your experience with “prophets” who “revealed” things to you that weren’t true is very telling. Had these “prophets” been able to manipulate you emotionally no telling where that might have led. There’s a reason why the Apostle Paul told the congregation to judge what was being spoken forth. That’s also why we are to exercise caution along with wisdom, discernment and understanding. For those of us outside the Mormon bubble it’s pretty easy to see the folly of the Mormon prophets. Unfortunately for those in the sect, they are shrouded in a spiritual deception that while appearing real to them, is false and dangerous but it makes them feel good. yes, feelings are definitely expected to weigh heavier than logic in the LDS religion. There is a prime example of that in the post I did about my visit recently by church for my membership removal. He kept trying to draw me back to how I felt at my baptism, and how I felt when I was more involved. My responses are in my post so I wont bother re-writing my conversation. There are many religions that focus on feelings and I think that is proof it cant be true if the facts dont line up. Yea, the LDS religious sect with its emphasis on being the shiny new object because they have a prophet seems to come with a lot of qualifiers. And yet, do the rank-and-file members know or operate this way? Absolutely not. The lead with the MM in their lessons is all about past prophets of the Bible, how they spoke for God, how their group has a prophet and because of that doesn’t it stand to reason that this is the “one true church”. There are lots of problems with this LDS logic, not-the-least-of-which is that calling someone a prophet doesn’t make him a prophet. Slapping a label on a food product with the word “lite” doesn’t mean it has any less calories. It’s just a label. What sort of label should the LDS “prophet” have in light of this article where by it appears that the definition of “prophet” has been significantly altered? As I pointed in my earlier post. Looking to the NT will pretty much inform us of everything we need to know about the nature of God, the nature of man, salvation, the Church, prophets, prophecy and on-and-on. What Joseph Smith and his subsequent “prophets” did was make up their own religion from whole cloth based on whatever thoughts seemed to meander through their brains at any given time. LDS folks don’t simply respect the guy at the top of their religious pyramid, they venerate him. This is extremely dangerous stuff. to lure them away . [ Deseret News 5-26-1945 ] . her life . They can’t be trusted to be consistent reliable guides . She does’nt need them . 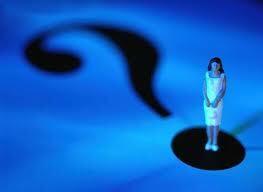 Personal revelation / inner witness ? Jesus ” . Do Mormons realize this fact ? these latter days prophets with what Jesus’ sent His apostles out to teach everyone –Rom 1:16.
the latter days prophets of Mormonism need to be added . prophets around today who claim to have fixed it are simply self clever salesmen . – Apostles under Brigham Young testified that his Adam God teaching was new light , truth . innocent . But he was convicted . persons died in one one the worst tragedies in the Western migration of the 19th century . They trusted his inner witness , and ” counsel ” . [ The Gathering of Zion , p. 243 ] . a good feeling / impression which they experience is the Holy Spirit’s ” voice ” etc . Here’s the problem. The claim has been that the people in the BoM are ex-patriot Jews, a lost tribe that came to the Americas in magic boats. These Jews were supposedly the ancestors of the American Indians. DNA testing gave a big “OOPS” to that claim as it shows that the ancestors were of Asiatic origin. So one little word, “among”, and there you have it. All better now! Now wouldn’t you think that we’d have a crisis of confidence here with the Mormon prophets? This is no small thing when it comes to how reliable or effective Mormon prophets are. If they missed something this glaring then they are indeed just free wheeling and supposing rather than having any serious messages from the Mormon god. Just think of the lengths the leadership has to go to in order to prop this myth up. And the people believe it. So prospects are told to read the BoM and if they get a good feeling about it then that means the Mormon god is communicating to them the truthfulness of the tome. But wait a minute because that’s not all. The burning in the bosom about the BoM gets expanded to include the LDS church as the one true church, Joseph Smith as a prophet and the current prophet as a real prophet. What we see is change after change but the LDS church has cover stories to feed to those who they have conditioned to believe the leaders are always right. What to do now that it is being said that isn’t exactly true. Wouldn’t you love to get these guys on a witness stand to explain the changes in the LDS testimony over time. Veracity is not one of their strong points. What I’d like to see is someone set-up a video camera outside of GC and ask these very dedicated LDS members a question. As to the first question, we now know that the Mormon prophets have erred when speaking on matters of faith. We also know that LDS apostle Bruce McConkie condemned the teaching in most vociferous terms. So it would appear that a Mormon prophet can be wrong when teaching on matters of faith. It would be difficult for me to follow prophets that are consistently said to be wrong about matters fundamental to the faith by those who follow them latter. You know you mentioned “ How do you know when and LDS Prophet is lying? His lips are moving. How about it? Would you pray for ‘Prophet’ Thomas S. Monson and the GAs that they would come to salvation and reconcile with truth (Jesus)? doctrines are now publically denied , dodged , or downplayed . for our day .” [ Ensign Nov 1974 , p. 35 ] . are their additions something we should be concerned about in light of Matt 24:11 ? attest to . In short , the latter days prophets of Mormonism can’t be trusted as guides . in His presence above . If I prayed for them my prayer would be that they would have eyes to see who the one true Gd is and heart that has a desire to find truth. I dont know what these leaders actually believe but im guessing that most probably dont have good reasons for why they have accepted the doctrine of the lds church. Some may not believe it at all and are actually atheist but continue to teach the doctrines of the church beause of the good moral teachings and charity. There are many reasons for why people continue to stay in a religion but until they are given that unavoidable call by Gd to dig and find the truth, they will not come out from darkness. You can plant all the seeds that you want but only Gd brings the increase. Proverbs 25:2 It is the glory of God to conceal a matter, but the honour of kings to search it out. Deuteronomy 29:29 The secret things belong unto the LORD our God; but those things which are revealed belong unto us and to our children for ever, that we may do all tje words of this law. Pray for the LDS leaders? Do you really think it would do any good? Let’s go all hper-Calvin on them and conclude they are non-elect! OK, OK……bad joke! For a little encouragement, look up the “Wide World Church of God” and what happened after their leader W. Herbert Armstrong died. I think it was Jack Haford’s group that use to walk around the outside boundaries of the property and pray fervently for that group. I sat in the parking lot of the temple in Ricks, Idaho (I think that’s the place; Ricks College) and prayed up a storm. I think it’s a good thing to do. Yep thats another group that is bananas. They have a couple of good points just like every other foreign god following religion but they are still in the woods. They call themselves 7th day adventist now dont they? They have a prophet and a prophetess (ellen g white). We can ask anything we want of the creator, but we must remember that He ultimately makes all the decisions. Moses did not deliver Israel out of Egypt, Gd did. Moses led them by obeying what Gd said but it was Gd who did the delivering. Not everyone wants to do what Gd commands them to do. All we can do is plead for mercy that all will be delivered in the end. That everyone will come to a knowledge and understanding of the one true Gd and return to obeying his commands. We can help by shining the light into the world and showing by our actions the right path to take. Ultimately it is up to them to haave the heart of Pharoah or the heart of Ruth. first president in the late 1800’s ) . revealers of correct knowledge on gospel topics we need to test that claim — 1 Jn 4: 1 . So are Mormon leaders RELIABLE guides ? Have they been TRUSTWORTHY as guides ? A review of their gospel teaching track record since 1830 will reveal the answer . they called ” Christendom ” or ” the Christian world ” as apostate . to what they non Mormon churches / preachers have provided their flocks . – they have exhibited a pattern of unstable teachings , vacillating . Failure to provide clarity . off as accurate information on Bible topics . doctrines is largely due to the fact they don’t have the priesthood . evident that they are guilty of this same type behavior which accused apostate preachers of ! Now what have Mormon leaders promised to their flock ? was taught/ condoned by him so they could be safe . AND WHAT TO TEACH . ” [ Ensign , May 1994 , Boyd Packer ] . black concerning their accusations against those who serve in Christian churches . A few years back Andy Watson, who was a regular contributor here, some how got connected to a guy who held a very significant role within the LDS sect and also had a heavy duty family pedigree in the (sect). This guy was no intellectual slouch, holding advanced, earned graduate degrees. Andy got into a e mail discussion with him at this fellows request. I really don’t know what the guy’s motivation was. The topic of the discussion basically centered around early church history; about the first 400 years of the Christian faith. Andy shared the e mails with me in confidence. They were very high level scholarly give-and-takes, good respectful tone and all of that. Eventually the discussions just ran out of gas and really weren’t going to go any where further than they had. What’s my point? When you first came to this blog you thought we were all pretty hilarious. But you got into an e mail discussion with rick and others and eventually the old light bulb went on as you began to study and research what was being presented to you. Eventually you saw the LDS church and Mormonism for what it is and ended up leaving. The guy that Andy interacted with stayed deeply entrenched in the LDS program. I told Andy that the guy just had way too much to lose to even consider leaving the LDS church. He had position, authority and an adoring crowd. His family was way big in the sect. It’s a funny thing, some people getting it and others not. Grant Palmer is an example of a highly educated person who got it. He’d say Joseph Smith was a very accomplished con man. Michael Quinn is a real puzzler. The dude knows it all when it comes to Mormonism. He’s been kicked out of the LDS church but he still believes in Joseph Smith. Quinn thinks the LDS church needs to be reformed. He holds out hope that a blessing that was spoken to him one time as a young man about becoming a general authority some day will come true. I’m on controversial ground here, but I’ve said it before. The more I’m involved in this type of ministry, the more I believe in the concept of election. I can sort of defend the concept from Scripture, but I wouldn’t argue it because it’s more of a gut type feeling of which I don’t put a whole lot of evidential stock in. So pray for the leaders of the LDS church? What can it hurt, really. But in the end people have to be led to the Lord through the ministry of the Holy Spirit. I’m not sure what role our prayers have within the confines of a soverign God, but we do pray as we are led. The more I’m involved in this type of ministry, the more I believe in the concept of election. Some in this life some in the next. It’s called Irresistible Grace after all. OK I couldn’t resist, being a fan of Charles Spurgeon. False prophets prophesy and reveal a false god. Now that Mormons are fudging on whether or not their prophets are as hot as they have been taught they are, maybe it’s time for Mormons to consider that this Mormon god is the leaders greatest sin.